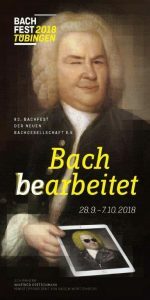 Even before our fond memories of the Bach Festival Ansbach have faded, we can start looking forward to our organisation’s next Bach Festival: from 28 September to 7 October 2018, our 93rd Bach Festival will take place in the university town of Tübingen. The programme is already available, and the exclusive ticket pre-sale service for our members has begun! You can order your tickets by telephone or through the website www.reservix.de. The Bach Festival programme and login data for ordering tickets will be sent to you by post. We look forward to seeing you in Tübingen! Our new newsletter was released today! Ansbach Bach Festival Starting Soon! In May 2018 we will be celebrating our organisation’s 94th Bach Festival in Rostock!